PARiM offers a wide range of different reports and list of them can be found under 'Reports' tab. Timesheet Summary gives you an overview of the actual shift times which come from the Time Clock page and based on when a person clocked in or out of the shift. Time Clock report allows you to view the ‘‘problems’’ with the shifts, for example, the lateness and overtime. Payroll report has all the necessary information on it for invoicing. 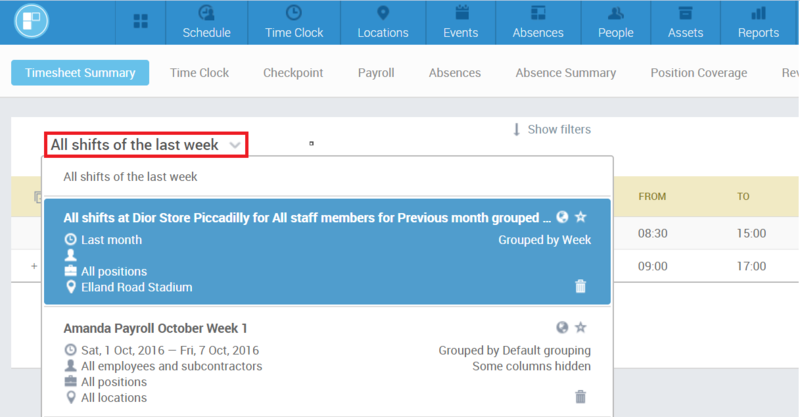 You can customise the report as needed and choose whether you want to include scheduled or actual shift times. 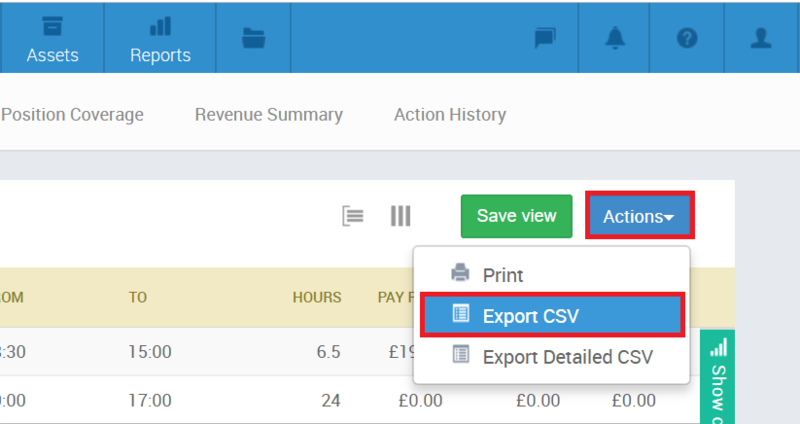 The report can then be exported as a CSV file and imported into a payroll software. Position Coverage report compares planned positions with allocated in terms of hours, rates and charges as well as allows you to monitor your % coverage by rate range, location or event. The report also works out your planned gross margin as is based on planned Schedule data. Revenue Summary report shows you what you should be charging your client by day, week, month or by location and is based on actual shift hours. Action History report is a report for when you need to look up any action taken in the system, for example, if an employee has been deleted from the system and you need to find out who and when performed this action then the Action History report will help you find that information. Please note: if your company has subscribed to extra modules then you will find there are more reports available depending on the module. For Checkpoints module there is a Checkpoints report, for Check Calls there will be an option to run Time Clock report for check calls specifically and for Absences module, there are two additional reports. Each of the reports can be customised based on your comapany´s needs and for that PARiM offers different options on how to look up the information. 1. Filter - filters help you narrow down the data to find exactly what you´re looking for. You can select the time period, department or a specific event and so on. information together. 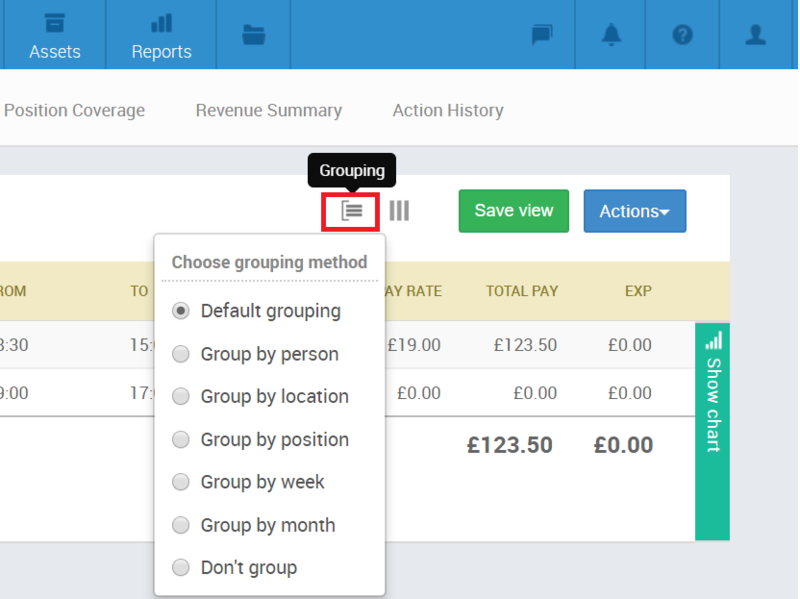 The available options can be found under the grouping icon at the top of the report (three horisontal lines). 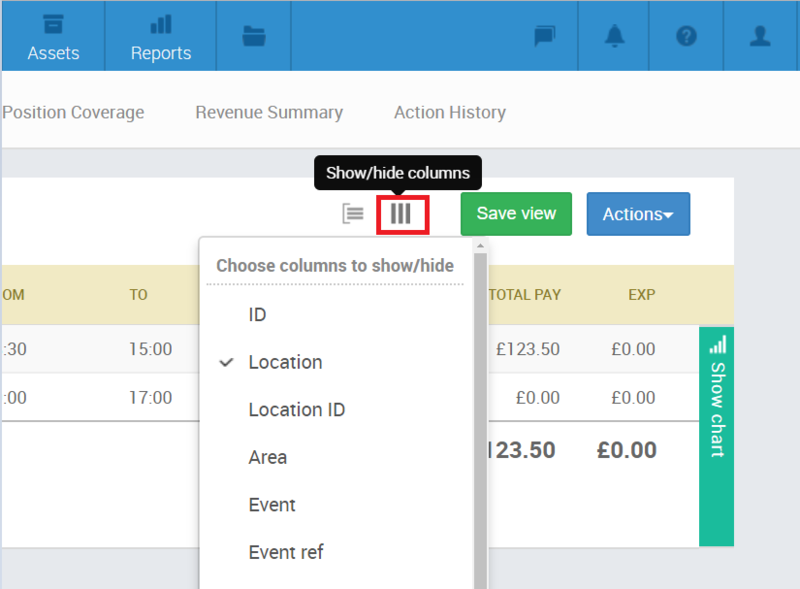 Columns options (thee vertical lines on top of the report) you can choose the relevant columns by ticking or unticking them. 4. Sorting - it is possible to sort the columns by clicking on the column name. An arrow will then appear next to it to indicate in which order the column is currently sorted. 5. Save view - if you have certain filters, grouping and columns which you use often you can use the ‘‘Save view’’ function which will save all this information for you. You can name and save the view and then use it later to avoid having to select and set everything again on the report. The saved views can be applied from under the ‘‘All shifts of the last week’’ filter. The reports can be exported from PARiM as a CSV file. This option can be found under the blue Actions button. You can choose whether you want to export it with the currently displayed columns or the detailed version where all the columns are included.